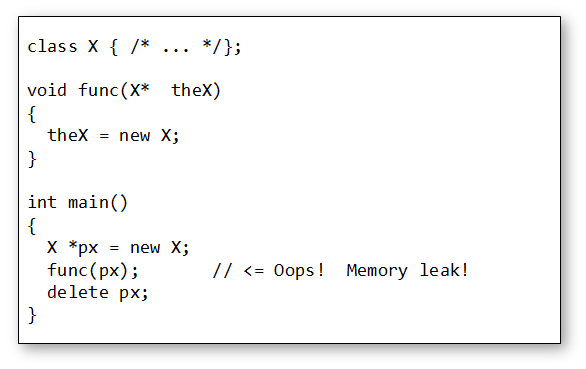 The dynamic creation and destruction of objects was always one of the bugbears of C. It required the programmer to (manually) control the allocation of memory for the object, handle the object’s initialisation then ensure that the object was safely cleaned-up after use and its memory returned to the heap. Because many C programmers weren’t educated in the potential problems (or were just plain lazy or delinquent in their programming) C got a reputation in some quarters for being an unsafe, memory-leaking language. Things didn’t significantly improve in C++. We replaced malloc and free with new and delete; but the memory management issue remained. I concede – the code above is trivial and stupid but I suspect if I looked around I could find similar (or even worse!) examples in actual production code. Languages such as Java and C# solved this problem by taking memory management out of the hands of the programmer and using a garbage collector mechanism to ensure memory is cleaned up when not in use. In Modern C++ they have chosen not to go down this route but instead make use of C++’s Resource Acquisition Is Initialisation (RAII) mechanism to encapsulate dynamic object creation / destruction within smart pointers. 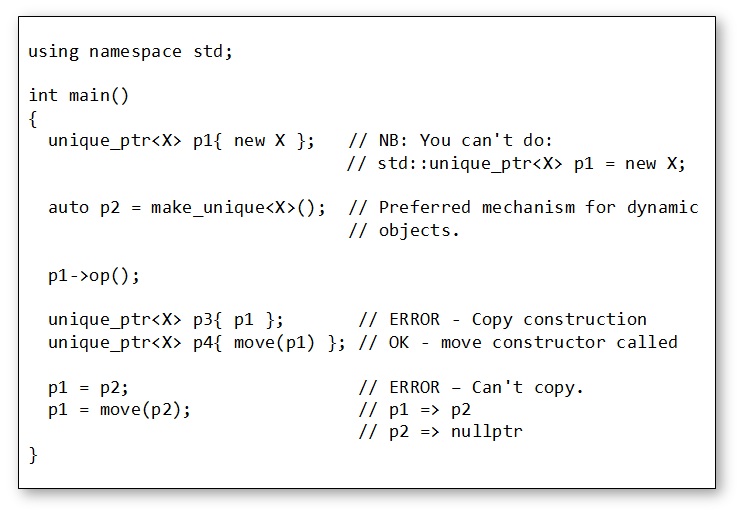 std::auto_ptr was introduced in C++98 as a single-owner resource-managed smart pointer. That is, only one auto_ptr can ever be pointing at the resource. 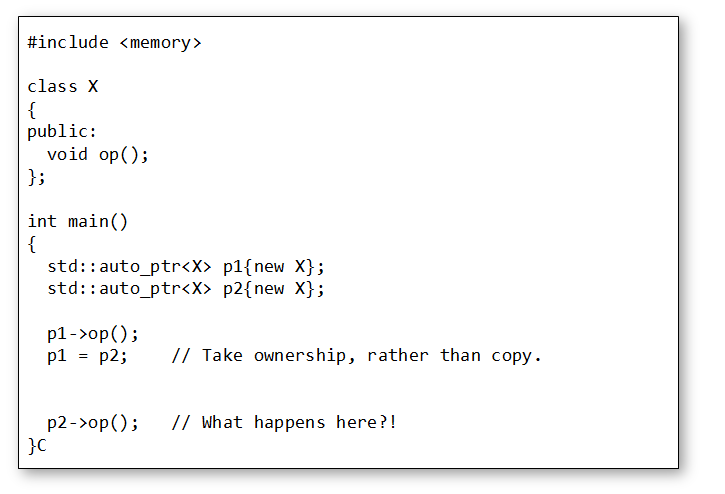 auto_ptr objects have the peculiarity of taking ownership of the pointers assigned (or copied) to them: An auto_ptr object that has ownership over one element is in charge of destroying the element it points to and to deallocate the memory allocated to it when itself is destroyed. The destructor does this by calling delete automatically. When an assignment operation takes place between two auto_ptr objects, ownership is transferred, which means that the object losing ownership is set to no longer point to the element (it is set to nullptr). This also happens if you copy from one auto_ptr to another – either explicitly, or by passing an auto_ptr to a function by value. std::unique_ptr allows single ownership of a resource. A std::unique_ptr is an RAII wrapper around a ‘raw’ pointer, therefore occupies no more memory (and is generally as fast) as using a raw pointer. Unless you need more complex semantics, unique_ptr is your go-to smart pointer. unique_ptr does not allow copying (by definition); but it does support move semantics, so you can explicitly transfer ownership of the resource to another unique_ptr. std::shared_ptr is a reference-counted smart pointer. Creating a new dynamic object also creates a new associated management structure that holds (amongst other things) a reference count of the number of shared_ptrs currently ‘pointing’ at the object. 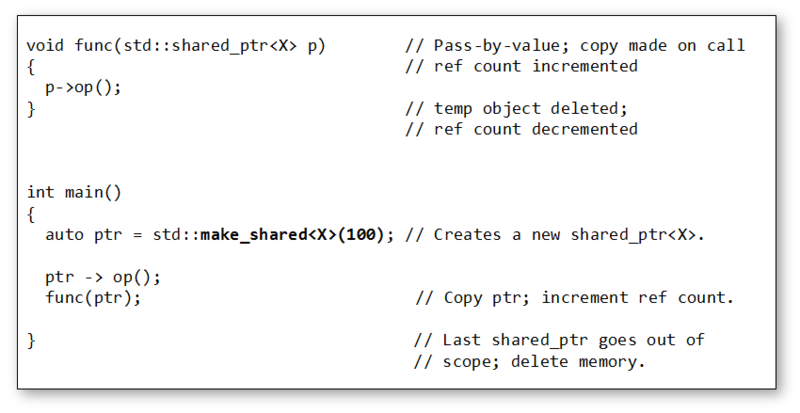 Each time a shared_ptr is copied the reference count is incremented. Each time one of the pointers goes out of scope the reference count on the resource is decremented. When the reference count is zero (that is, the last shared_ptr referencing the resource goes out of scope) the resource is deleted. std::shared_ptrs have a higher overhead (in memory and code) than std::unique_ptr but they come with more sophisticated behaviours (like the ability to be copied at relatively low cost). Once again, the standard library provides a utility function make_shared<T>() for creating shared dynamic objects; and, once again, this is the preferred mechanism. When you create a weak_ptr it must be constructed with an extant shared_ptr. It then becomes a ‘placeholder’ for that shared_ptr. You can store weak_ptrs, copy and move them, but doing so has no effect the reference count on the resource. Note you cannot directly use a weak_ptr. You must convert it back to a shared_ptr first. weak_ptrs have a method, lock(), that creates (in effect) a copy of the original shared_ptr, which can then be accessed. A weak_ptr can therefore be invalid – that is, referencing a resource that is no longer viable. You should use the expired() method on the weak_ptr to see if it is still valid, before attempting to access it (alternatively, calling lock() on an expired weak_ptr will return nullptr). We’ve got to the end of the Bitesize series for Modern C++. You should now be in a much stronger position to explore the new features of C++ in more detail. If you missed an article, or just want the complete set in a single document, you can download the full set of articles as a PDF, here. To learn more about Feabhas’ Modern C++ training courses, click here. This entry was posted in C/C++ Programming and tagged auto_ptr, C++, C++0x, C++11, C++1y, memory management, resource management, shared_ptr, smart pointer, unique_ptr, weak_ptr. Bookmark the permalink. This blog is a goldmine for C++ programmers. I'm trying to read the blog posts in order. Would it be possible to enable the Next-Prev links that are typically shown at the bottom of individual blog posts? This sort of detail was deliberately glossed-over in these 'Bitesize' articles, in order to get people going with the new C++ features.